Usk Chirps: What's in a Name? Usk - it's the name of a town and the name of the river that runs through it! But what are the origins of 'Usk', how long have people lived here and what does its name mean? What is the history behind Usk and what are the other names associated with this small town in South Wales? There has been human activity in the Usk area since the Mesolithic period or Middle stone age (around 10,000 - 4,500 BC). Around 700 artefacts from this time, in the form of worked flint tools that would have been used for hunting animals and butchering them, were discovered during excavations of the Roman fortress at Usk showing that hunter, gatherer tribes may have lived in or migrated through the area. Flint axes and sickle blades and evidence of wattle construcred buildings, from the later Neolithic period (4,500 - 2,500 BC) have also been discovered at Rhadyr and Trostrey to the North of Usk. These tools and structures are more associated with early forms of farming and settlement, so it likely that people began to settle in this area many thousands of years ago. 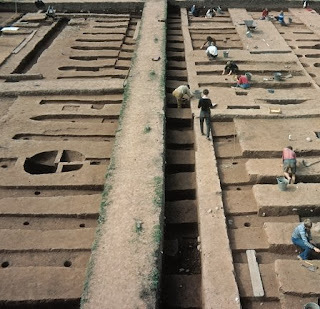 During the Bronze and Iron Ages (between 2,500 BC - AD 43) when metal working resulted in more sophisticated buildings, tools and weaponry evolving, it is likely that local Silurian tribes fought over territory with the Dobmuni Tribes (who lived in what is now Herefordshire and Gloucestershire). In these lower reaches of the Usk Valley, we can still see plain evidence of the impressive hill forts they built today with earth mounds visible at Clytha (Coed y Bwnydd) , Llancayo (Llancayo Camp), Llansoy (Great House Camp), Gwehelog Fawr, Llangwm (Gaer Fawr), Bryn Gwyn and Gray Hill near Wentwood. 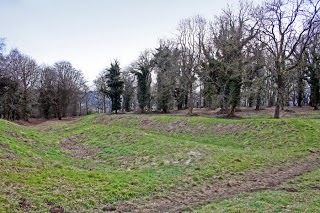 Usk Castle is also reputedly built on the site of a former Celtic hill fort. 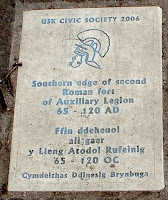 It seems that the first major settlement at the site of what is now the town of Usk, occurred in Roman times. Extensive excavations in the mid to late 1960s (I remember these as a child happening in the fields behind the prison and on the land where the houses at Priory Gardens were built adjacent to the Sessions House and at the old Cattle Market site) and later, lesser excavations through into the mid 1980s at various points under buildings in the town, have confirmed the existence and boundaries of a large Roman site at Usk, believed to be the Roman Fortress of 'Burrium' (also referred to as 'Bullaeum', 'Burrio' and 'Burros'), mentioned by the Roman historian Tacitus. The construction of the fortress of Burrium can be linked to campaigns of the invading Roman army to quell the fierce local Silurian tribes. The Roman name of 'Burrium' may be translated as 'Place of the Knobs' from the Latin word 'bulla' meaning 'bubble, knob, stud' and could be a reference to the 'knobby' series of hills surrounding Usk, but as this is also the name of a protective phallic amulet worn around the necks of male Roman children this might lead to a slightly more interesting translation! Around 500 Roman soldiers and cavalry would have been based at the fortress of Burrium which covered an area of around 48 acres between the years of AD 55 - AD 66. 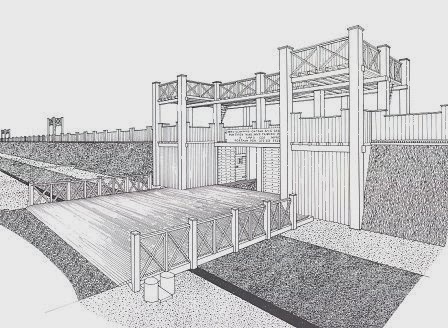 Susceptibility to flooding has been cited as a possible reason, but, it is not really known why in AD 66, the Roman Legion based at Burrium relocated to Viroconium Cornoviorum much further North at Wroxeter in Shropshire. A small caretaker garrison remained at Burrium until AD 75. If you are interested there are artefacts from the Usk excavations at the Roman museum in Caerleon. 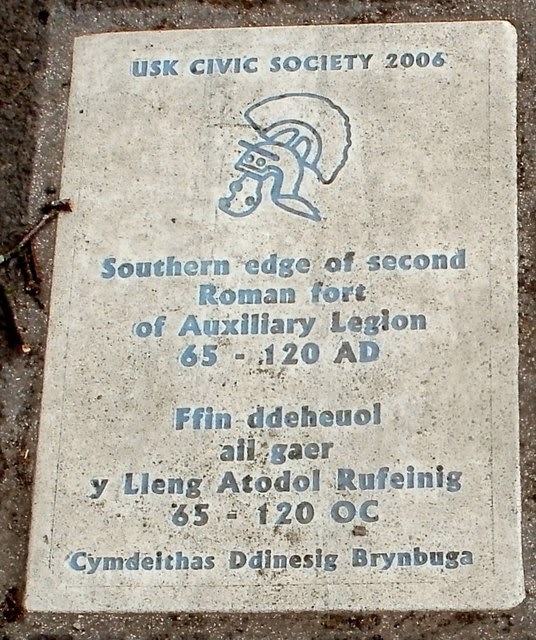 There are also plaques placed in the pavement by Usk Civic Society at various points around Usk town to show the boundaries of the Roman Fortress of Burrium. 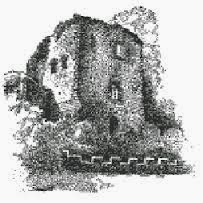 The Norman town of 'Usk' (the name we still know it by today) with its castle planned and built by Richard De Clare between 1154-70, took its name from the River Usk running through it. The word Usk (Wysg in Welsh), is derived from the ancient British 'iska' or Celtic 'uisge' meaning 'abounding in fish' or 'water', which also appears in other river names in the UK such as Exe, Axe and Esk and other variants. Interestingly the Scottish word 'whiskey' is derived from the same source. The root of the Welsh name for the town 'Bryn Buga' is slightly ambiguous. The first part 'Bryn' meaning hill, clearly refers to the hill on which the castle is built but 'Buga' (be careful how you say this - it should be pronounced to rhyme with meagre), could possibly be a reference to the personal name of a giant called 'Buga' or it could be derived from the Welsh word 'bugeilio' meaning to watch - from which the Welsh word for shepherd 'bugail' is derived - in which case the name Bryn Buga would translate as 'look out hill'. In my view this is the more likely translation. As children we knew one of the woods near our cottage on the hills surrounding Usk, as 'Shepherds Wood', so I like to think there could be a link there with the Welsh name for Usk with that. 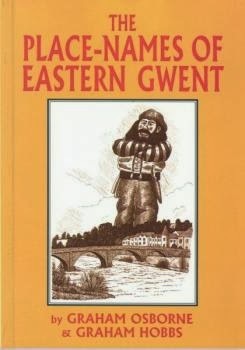 However, many have latched on to the more fanciful and exciting, fairytale notion of the Welsh giant Buga living in his castle on the hill above the town.